190 pages | 35 B/W Illus. Provide details of guidance documents publically available that students will be able to refer to. The revision guide is fully aligned to the current NEBOSH syllabus, providing complete coverage in bite-sized chunks, helping students to learn and memorise the most important topics. 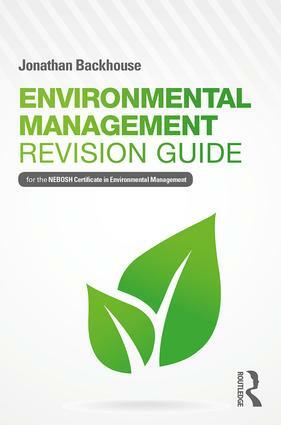 Throughout the book, the guide refers back to the Introduction to Environmental Management, helping students to consolidate their learning. Jonathan Backhouse is a chartered health and safety practitioner, qualified teacher and author. Since becoming self-employed in 2002 he has gained a vast amount of consultancy and training experience (working in the UK, Europe, Africa, the Middle East and the USA) within all aspects of health and safety, including fire safety, first aid, food hygiene and environmental management. His qualifications include a Master of Arts in Professional Practice, in the context of Education, and a Master of Research in Occupational Health, Safety and Environmental Management.